Cisco Talos presents a conference by Defenders, for Defenders. Talos had one goal in mind when creating a brand new conference: Make something that we'd want to attend ourselves. As such, the Talos Threat Research Summit is aimed at being a one-day conference by defenders, for defenders. This summit is designed to assist you in keeping your users and network safer. Our roster of experienced speakers will share their deep expertise in network defense, tracking the bad guys and identifying trends in the threat landscape. The goal of the summit is that you will leave with up-to-date, actionable intel you can take back to your network and use immediately. There are also opportunities for networking with your defense-focused peers and security leaders. More information, including the agenda and speaker line-up will be released in the coming weeks, so stay tuned! Where: Hyatt Regency, Orlando, Florida – at Cisco Live! A Talos Threat Research Summit pass provides access to the Sunday event only. To attend Cisco Live, please register for a Full Conference, IT Management, or Imagine Pass to spend the week in Orlando and transform your outlook, your career and your potential. 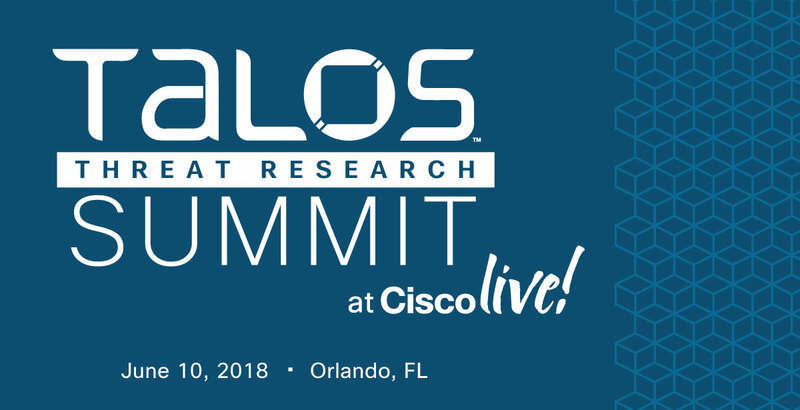 The Talos Threat Research Summit is an add-on to Cisco Live registration, but can also be purchased without a full Cisco Live registration. If you have already registered for Cisco Live, you can add the Talos Threat Summit for $195. You may also register for the Summit without a Cisco Live registration for the same price. All options will be displayed to you during the registration process.